In this cake video tutorial, I’m going to show you how to make elegant and impressive marbled chocolate panels for your special occasion cakes! Nobody would ever guess how simple this cake technique is, and the design options are endless! 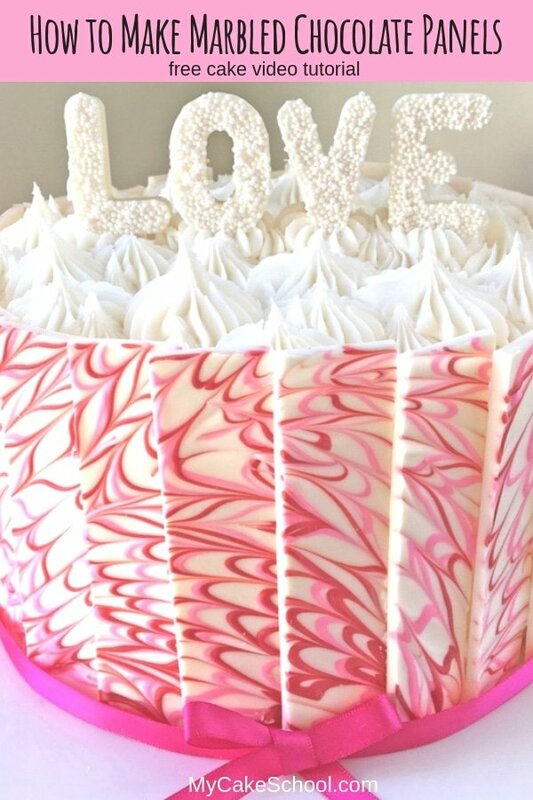 With Valentine’s Day just around the corner, our white chocolate panels are swirled with pink and red for an effect that is beautifully unique. Keep this chocolate panel cake method in mind to suit the color scheme for whatever your occasion may be. I also love the simple elegance of solid white or chocolate panels, especially for wedding cakes. One reason that I LOVE to work with chocolate candy coating is because it is so quick and easy. Simply melt your coating in the microwave, create your designs, and they are ready to apply to cakes or cupcakes in minutes! We have many cake tutorials that incorporate candy coating designs in one way or another, but panels are one of my favorites! I hope that you enjoy this cake video! Don’t forget to scroll beneath the video for a quick rundown of our most important notes on creating chocolate panels, as well as details on the products used. The cake that we are decorating in this video is an 8 inch tier, frosted with our Fluffy Vanilla Buttercream Frosting Recipe. Any frosting would be fine with this design, and the panels could be applied to cakes of all sizes, as well as tiered cakes! Have fun! *We used an 8 inch tier, frosted in our fluffy vanilla buttercream recipe. Vanilla Buttercream We used a double batch of our Fluffy Vanilla Buttercream. Spread the melted white coating over the cookie sheet. Keep in mind that you are actually creating two rows of panels from this large rectangle of coating. Drizzle your pink and red melted candy coating across the white candy coating. Work quickly so that the chocolate doesn't begin to set. Use a toothpick to gently drag through your colors, marbling them with the white coating. Allow to set at room temperature. This may only take 5 minutes-- or it could take closer to 10-15. When it begins to move from a glossy finish to a matte finish, it's time to mark your panels. Use a sharp knife cut your large rectangle of coating in half lengthwise, creating two long panels (approximately 5 inches in height if you are going by our measurements). Then make your small cuts across the length of your rectangles, to create two rows of panels. Ours were approximately 1.25 inches wide. (But I was eyeballing it, not measuring). When you are ready to decorate the cake, chill the panels in the freezer for about 10 minutes (or in the refrigerator for a bit longer.) until firm. Add remaining melted candy coating into the cavities of your mold. Scrape off excess with a knife, and sprinkle with white sprinkles. Chill in the freezer for about 15 minutes or until firm. Cover the top of the cake in buttercream stars piped from a french tip 869 (or your tip of choice). Top with LOVE. *I didn’t show it in the video, but you can see that I used a pink ribbon at the base of this cake to create a border. You can secure the ends in back with a dot of piping gel, chocolate, or your edible glue of choice. We tied the front bow separately and attached with a dot of chocolate. The set of times for the candy coating can vary based on the temperature of your kitchen and countertops. So, try to work as quickly as possible. If your countertop is cold to the touch, it’s a good idea to place a dish towel or pot holder beneath it so that it will not cool off so quickly. I spread the chocolate to a thickness of about 1/8 inch. You’ll want to reserve a bit of the chocolate for the “LOVE” topper. If you do not have a letter mold like we used, you could also pipe the word love on a waxed paper lined cookie sheet and sprinkle with white sprinkles or sugar pearls as we did. Just keep in mind that the thinner the letters are, the more fragile they will be. Another idea for chocolate panel cakes, especially when the panels extend beyond the top edge of the cake as ours do, is to fill the top with chocolate candy, strawberries, raspberries, chocolate curls, or other favorite toppings for a bit of drama and height! Marbled chocolate shards can be made in the same way, but you would make your scoring more triangular, or you could break the chilled bark off piece by piece without scoring at all. 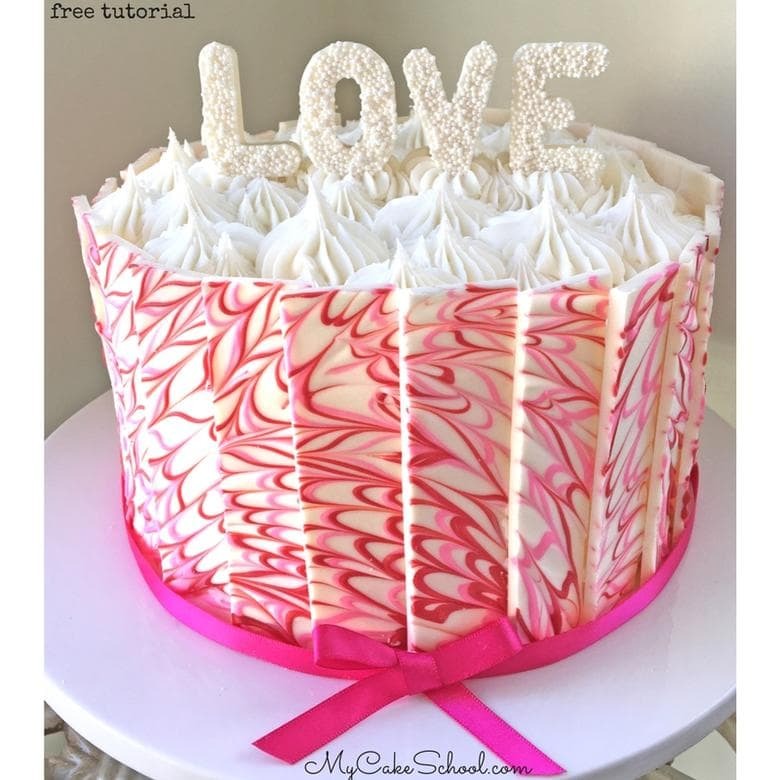 We hope that you enjoyed this cake decorating video tutorial! Don’t miss our full collection of Free Tutorials and tried and true Cake and Frosting Recipes! Also, if you are interested in learning more about cake decorating, you should consider becoming a member of My Cake School! Our membership are only $30/year and will give you full access to our collection of hundreds of cake video tutorials as well as forums, etc. for as long as you are a member! We would love to have you! You can find all of the My Cake School Membership details here! : Joining Information for My Cake School! Looking for more Valentine’s Day Cake inspiration? 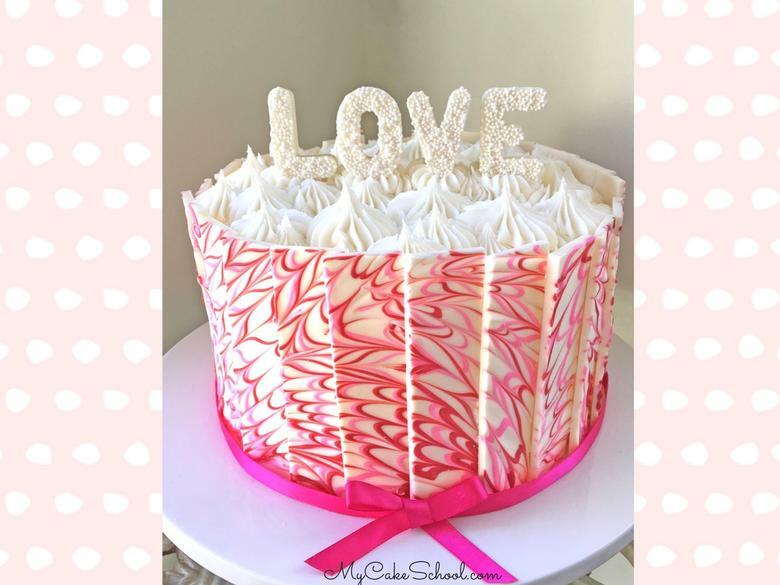 Here is a roundup of a favorite Valentine’s Day Cakes, Tutorials, and Ideas! Love this! I really need to start playing with chocolate more :-) Fabulous and easy – Love it! How many choc panels do you need for the overlapping? Thanks for your comments!! So glad that you like the cake! @Julie, I like that idea! @Margie- it wound up taking about 23 panels to make it around our 8 inch cake. You may have one or two extra (which is a good thing). I love this!! A bit confused as to whether candy coating and white chocolate are the same?? OR is candy coating made of chocolate?? Can white chocolate chips melted be used for this technique?? Thanks for clearing this up. Hi Chandra- The main difference between a true white chocolate and candy coating is the type of fat used. White chocolate uses cocoa butter for it’s fat while coatings, bark, etc. use palm oil. White chocolate chips can be used for this technique although some brands melt better than others- I like the way bark coatings melt (we used Candiquik for the white chocolate coating)…and then we used Wilton Candy Melts for the pink & red. The color of the white chocolate chips may vary, but often are not a true white, just as with real white chocolate. Wilton does have Bright White Candy Melts as an option. Do you temper your chocolate first? No, since we are using candy coating, there is no need to temper. We microwaved the candy coating to melt it. Hi Mp, Good News! Neither the Candiquik candy coating or Candy Melts need to the tempered. Hi Kisha, The 24 ounces is enough for the panels and the letters. The word LOVE will use approximately 3 ounces total. The amount used to make the panels will vary from person to person depending on how thick you spread the chocolate. Don’t make them too thin that they will break easily or too thick making them hard to cut. You will probably have a bit left over for make chocolate hearts for decoration, if you like. I made this cake for Valentine’s Day. Love the tutorial and the cake was gorgeous. Needed two packages of candiquik though. Thank you.